Soak the corn husks in a large pot with hot water, make sure there’s enough water to cover the husks completely. Leave them soaking until they are soft and can be easily bent. Drain the husks and use paper towels to pat them dry. Blend 2 1/2 cups water and chicken stock with the chipotle peppers. In a medium-size container, combine flour, baking powder and salt. Combine vegetable shortening and sweet potato puree and blend with an electric mixer on medium speed, until smooth and creamy. Reduce speed to low; add flour mixture and chipotle mixture and blend to combine. Gently fold in the walnuts. Spread 1/4 cup of the prepared mixture over 2/3 of each corn husk leaving 1/4-inch margin on the widest part and a 3-inch margin on the skinniest part of the husk. Fill each tamale with 2 tablespoons of queso fresco. Fold the husks into thirds to fully cover the dough and the cheese filling. Fold the bottom part of the husk up to prevent the dough from spilling and place them upright inside a large pot. Carefully add 2 to 3 cups of water to the pot without getting water on the inside of the tamales. Cover the pot and bring to a boil. Reduce heat and cook on low for 45-50 minutes. Add a little more water if needed. Remove from heat and let cool for 10-15 minutes before serving. Freeze any extra tamales for a later occasion. This holiday season, treat your guests to these delicious sweet potato tamales with chipotle and walnuts. They make an excellent vegetarian option for dinner. These tamales have an intense smoky flavor thanks to the walnuts and chipotle peppers in adobo that help to bring out the natural sweetness of the sweet potatoes. 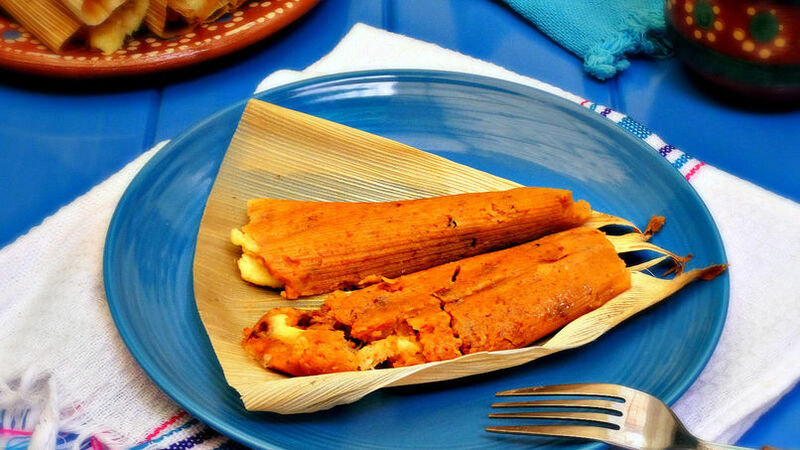 Make these colorful and flavorful tamales! Everyone will love them.